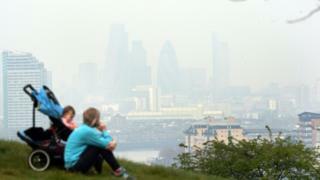 How can the UK reduce air pollution? The European Commission says the UK has two months to address "persistent breaches" of air pollutants - specifically nitrogen dioxide - after it issued a "final warning". Nitrogen dioxide (NO2) comes from sources including factories and vehicles, particularly diesel engines, and is linked to an increased risk of respiratory problems. Why was the UK given a warning? Under EU law, when air pollution limits are breached member states must implement air quality plans to bring the levels back down. The commission says the UK failed to address repeated breaches of legal air pollution limits for nitrogen dioxide levels in 16 areas including London, Birmingham, Leeds, Southampton and Glasgow. It says if the UK fails to act within two months, it could take the matter to the European Court of Justice. The UK could face a lump sum fine or a daily penalty payment decided by the court. The commission says more than 400,000 people die prematurely in the EU every year as a result of poor air quality. Germany, France, Spain and Italy were also served with warnings. To date, legal action on NO2 has been taken against 12 member states, the commission says, with ongoing infringement cases against Austria, Belgium, the Czech Republic, Denmark, France, Germany, Hungary, Italy, Poland, Portugal, Spain and the UK. The commission says air quality standards are being exceeded in 23 out of 28 member states - including more than 130 cities across Europe. What does the European Commission say should be done? It suggests possible measures to lower polluting emissions include reducing overall traffic volumes and switching to electric cars. The commission says reducing emissions from diesel-powered vehicles is an "important step" towards meeting the EU air quality standards. What can the UK do to reduce air pollution? The warning has reignited calls from organisations for a "clean air act" with targets to reduce pollution levels in the UK. Friends of the Earth say an act will be needed to protect the public from air pollution once the UK leaves the EU to "help safeguard existing legal protections". Jenny Bates, Friends of the Earth air pollution campaigner, says road traffic is the biggest problem and diesel vehicles are the "worst of all". Dr Penny Woods, chief executive of the British Lung Foundation, agrees that traffic emissions are "the main culprit", particularly those from diesel. "Scrappage incentive schemes will help drivers to move to cleaner vehicles, without being financially penalised," she said. What does the government say it is doing? The government says it is "firmly committed" to improving the UK's air quality and cutting harmful emissions. It says the UK meets the legal limits for "almost all" pollutants. In October, proposals were announced for clean air zones for Birmingham, Leeds, Nottingham, Derby and Southampton by 2020. The zones aim to encourage drivers to choose less-polluting electric cars and will also introduce restrictions on older, polluting commercial vehicles. Under the plans, electric cars could be given priority at traffic lights and exempted from one-way systems. They could also be given preferential parking spaces and lower charges. Councils with clean air zones are also expected to restrict access to older buses, coaches, taxis and lorries with emit high levels of gases such as nitrogen dioxide. Birmingham and Leeds also plan to extend restrictions to polluting vans. This could mean a charging zone for commercial vehicles with high levels of emissions, or by introducing stricter licensing requirements for buses and taxis. The clean air zones are the government's response to a UK Supreme Court ruling, which ordered it to take action to meet European limits on air pollution. The Department for the Environment, Food and Rural Affairs (Defra) said the government had committed more than £2bn since 2011 to increase the uptake of ultra-low emissions vehicles and support greener transport schemes. "We will update our air quality plans in the spring to further improve the nation's air quality," the spokesperson said. Video Could air pollution cause brain damage? Reality Check: Is Oxford Street the world's most polluted?